Syracuse in Sicily. Time of Dionysios I, ca. 405 to 367 BC. Bronze Drachm. Date : Sear dates these to the time of Timoleon ca. 344 to 336 BC, but it now appears that they were probably struck during the time of Dioysios I (405 to 367 BC) most likely ca 390 BC. Size : 28.5 x 29.5 mm. Weight : 31.57 grams. Grade : VF with a mottled medium to dark green patina. There are a few small planchet defects in the form of casting bubble holes on the obverse (from when the blank flan was made). The coin looks a little better on the image than it does in the hand, because the mottling of the patina is not clear. 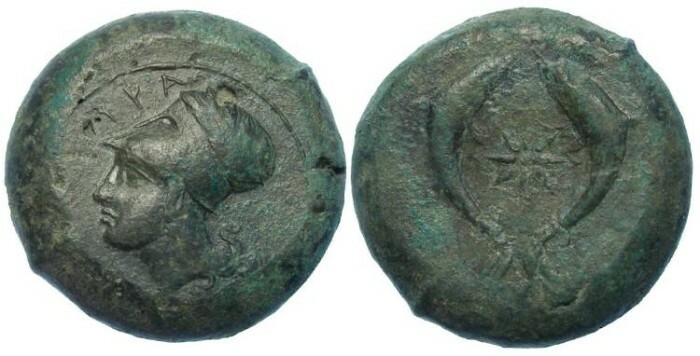 Obverse : Head of Athena left, wearing a Corinthian helmet, with URA to the upper left (if the leading S was ever there, I can see no evidence of it). Reverse : Two dolphins flanking what might be a star fish, but I believe is more likely a representation of a comet coming straight at you.